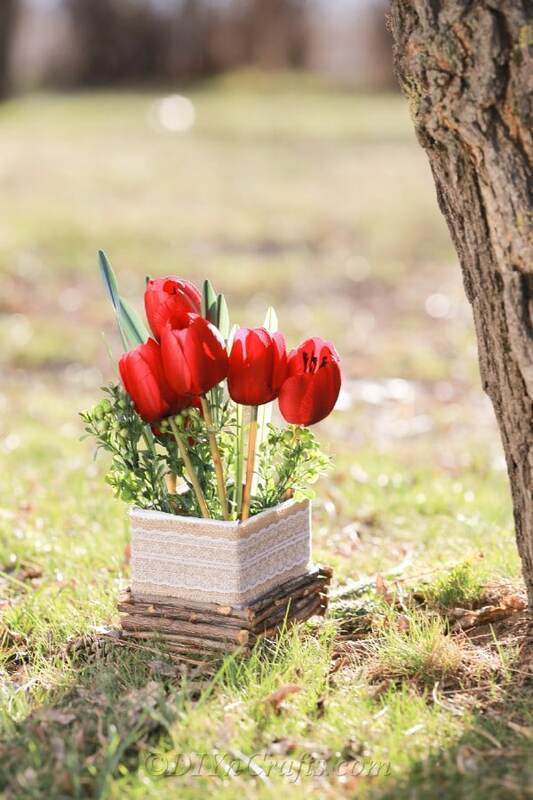 If you need to make a floral centerpiece for an Easter party, this easy video tutorial to create rustic decor with tulips will be perfect. 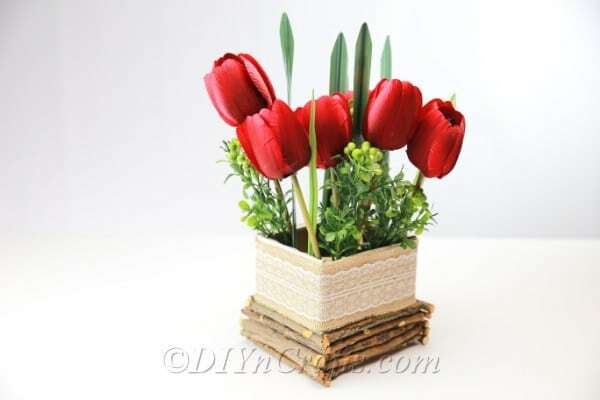 This arrangement also can look beautiful anywhere else in your house during springtime or any other time of the year. While there are only a handful of materials and tools required for this project, some of them require some discussion to help you choose the most suitable supplies. You are going to need a small box. In the materials list, I mentioned that a Kleenex box will suffice. I used a small packing box, but the Kleenex box gives you about the right size reference. I do recommend that whatever box you use to be relatively plain. This will contribute to the homespun look, and will not take away from the decoration you are doing. I also mentioned a lace ribbon. Any type of ribbon which has a rustic appearance will work. You also could substitute burlap. 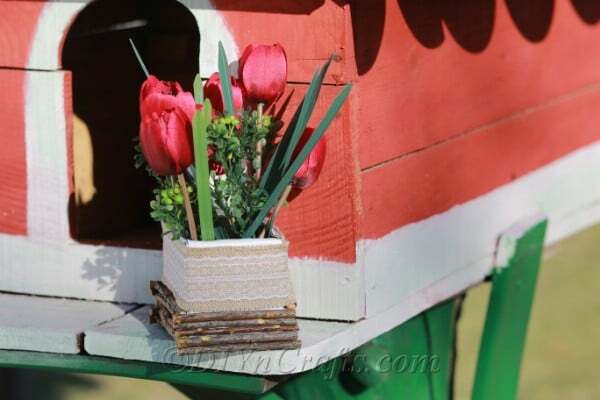 Inside the box, you will be placing some faux tulips and sprigs. You can substitute different flowers if you prefer, but you will need flowers which have long stems. 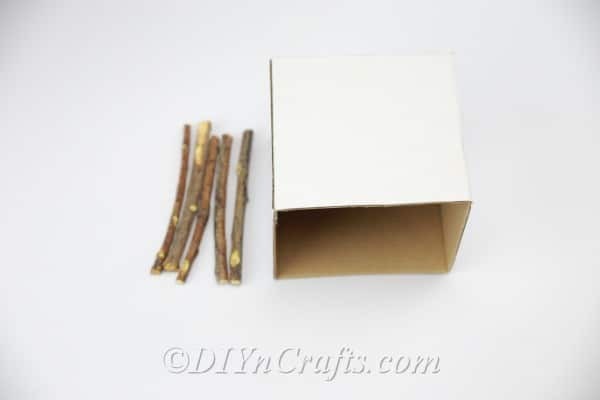 Finally, you were going to need some small sticks or branches which you will be attaching to the outside of the box. 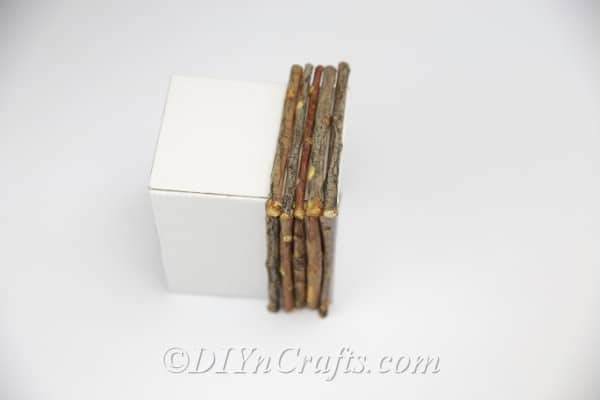 These branches or sticks should be as straight as possible, cut into small segments. Ideally, the segments should be the same length as the sides of the box. You could get away with smaller segments if you prefer. But they will need to add up to the right length so that you obtain full coverage. Once you have gathered these materials, you will be ready to get started. See the full supplies and tools needed below along with written directions to go with the steps you see performed in the video tutorial. 1. If the box you have selected has a top to it, begin by removing this. This will be easiest using a precision cutting tool. 2. 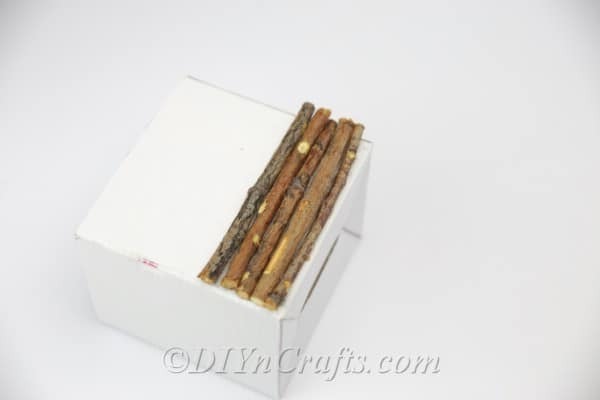 Use hot glue to attach the sticks to the first side of your box along the bottom edge. It is your choice how high you want to stack them. I went with about five sticks to a side. 3. 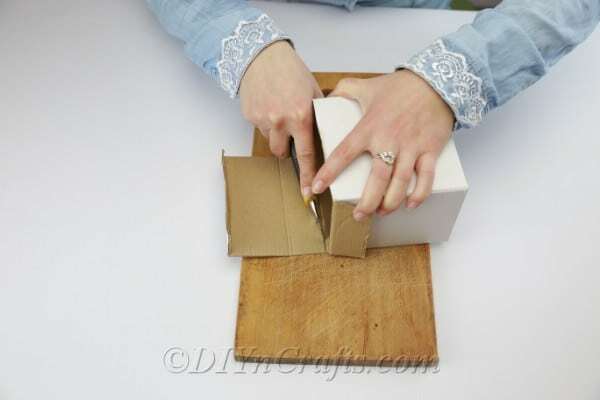 After you are done with the first side, turn the box over and do the same on the other three sides. 4. 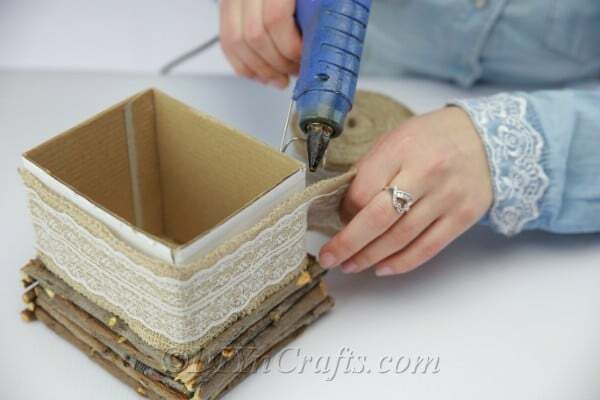 To decorate the top portion of your box, wrap some lace ribbon or any similar supply around the outside of the container above the branches. 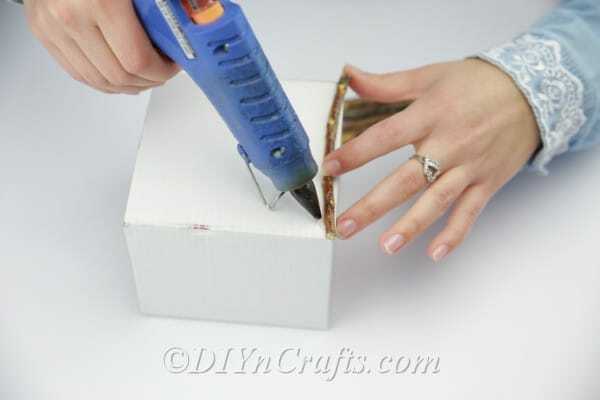 Once again, it’s up to you how much of the box you want to cover, but I recommend covering most of it so that it is less obvious that you started out with a simple cardboard container. 5. The last step is simply to fill the box with your faux flowers and sprigs, arranging them as you desire to achieve an artistic effect. 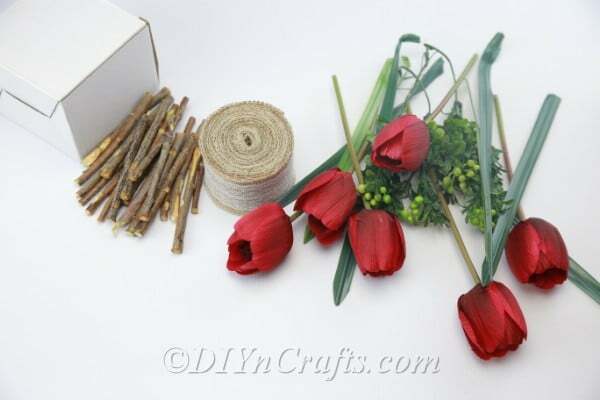 Once you have finished crafting your floral decoration, you can decide where you want to display it. It would look beautiful as a centerpiece on your kitchen or dining room table. But you can also set it on any other surface in your house to achieve a lovely effect. It also would be pretty on the corner of an office desk, perhaps in the reception area. If you had fun making this craft and are looking for other similar projects for Easter, we have a few other video tutorials that you will definitely want to give a try. 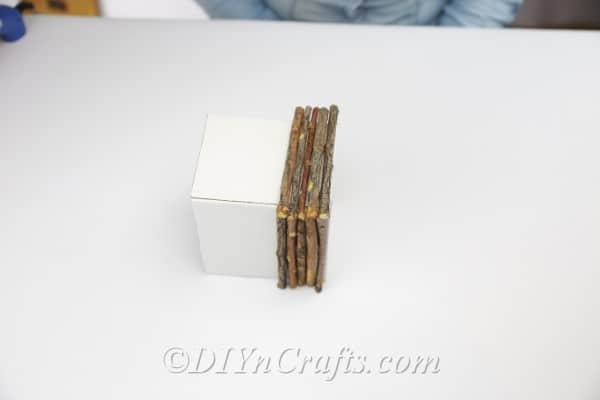 A similar project that you can start with is this one to make a DIY rustic Easter centerpiece using the pages of an old book. 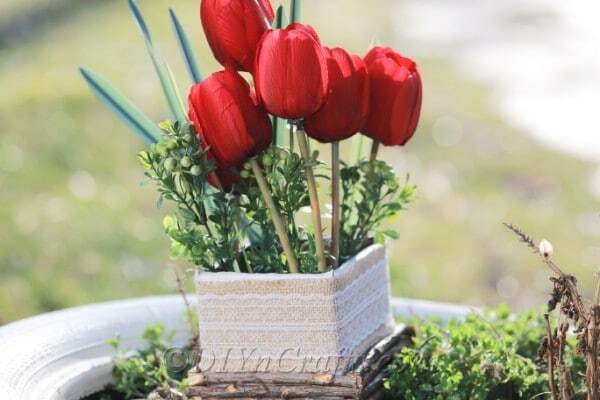 You also will probably enjoy making a colorful candy vase decoration for Easter. 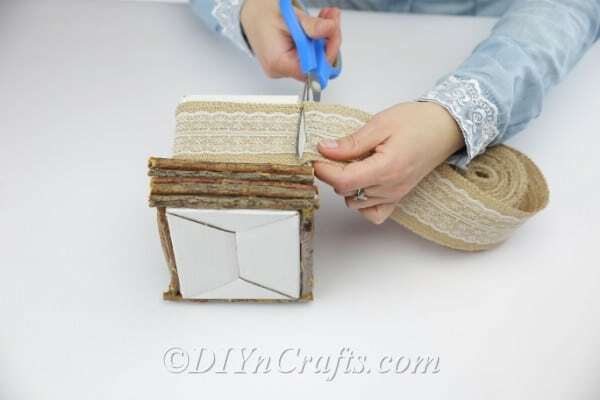 In search of other easy rustic crafts for Easter? 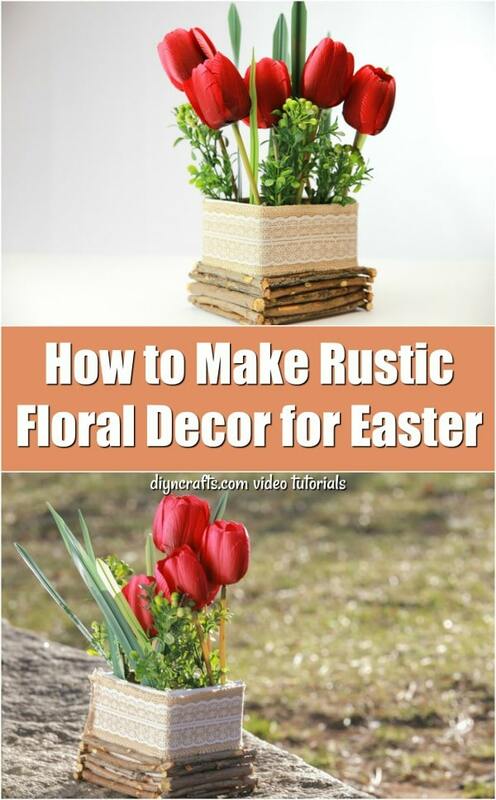 Try making a DIY rustic twine Easter egg decoration. You can also make a cute Easter bunny out of an old book. 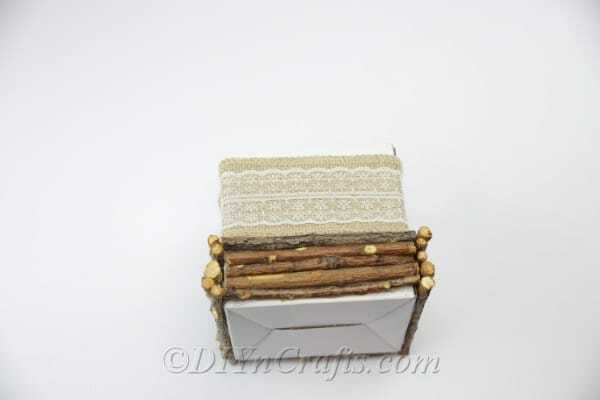 We are constantly adding new craft tutorials to our site. So check back in again soon to discover new fun Easter projects!